Laini Taylor's debut book, Blackbringer, is the first in the Faeries of Dreamdark series, and it's going to win her legions of fervent fans. To quote my own blurb (if I may be so bold), "A tremendous book--a vivid adventure in a place both familiar and new, characters that made me laugh and cheer and a truly frightening villain. I thoroughly enjoyed the read." I'm so pleased to host Laini in our ongoing quest to bring book happiness to the world! Me: So, you’re a pretty fantastic writer. Characters, setting, plot, language—you’re a master of all the building blocks. I’d love to know something about your writing process. LT: Geez, thanks!!! Coming from you, that means A LOT! I could go on and on about process (actually, I just DID go on and on about it: just last week I launched a new website called NOT FOR ROBOTS that goes into embarrassing detail about the strategies I have to use on myself to get my work done! It’s at: www.notforrobots.blogspot.com). My natural tendency is to micro-edit every single sentence as I write it, to happily tinker around with language as if I think I’m writing a poem, not a novel. It would take a very long time to write a novel this way! So, much of my process is about keeping the storytelling going as I make my tortuous way through my first draft, and not letting my persnickitiness take over until I’m ready for it. Is there anything about publishing your first book that surprised you? Anything about being an author that’s different than you imagined when you were younger? Hm. I think I once imagined yachts were somehow part of the deal, and vine-draped terraces in Italy, and lots of witty, fascinating friends swinging by in the evenings with violins and absinthe and poetry. Ha ha! I am sure I had some ludicrous daydreams about the life. But seriously, one thing that does really stick in my memory is a scene from the movie “Back to the Future,” in which the main character’s dad, who’s a writer, gets a box of his new book delivered by his publisher. I’ve always remembered that scene, and it’s funny -- my husband has seen that movie more times than me but he doesn’t remember it, but many writers I’ve asked know exactly the scene I’m talking about. I guess we all crave that box of books! And when my first box came, it was just as cool as I had hoped. One thing that did surprise me about publishing, even though I thought I was prepared for it, was the god-awful byzantine complexity of publishing contracts! What a horror! Also, it was a nice surprise to discover what cool, unscary REAL PEOPLE work in children’s publishing! (I totally know that exact scene! It's been in my heart for years.) How did the story of the Faeries of Dreamdark unfold for you? immediately realize that’s what I was writing. recent years is The Carpet Makers by the German sci-fi writer Andreas Eschbach. It was discovered by Orson Scott Card at a convention, and he saw to it that it got translated into English. Please tell me there will be more stories about Magpie (you know that’s what we call our daughter Maggie, right?). Thanks, Laini! I love your hair, by the way. So sassy and beautiful too. We'll all be waiting breathlessly for Silksinger. I just read Blackbringer. I"m staring at it. I LOVED that book, so it's really cool that I got to read this! And I just got B1000! I have to save it for my vacation next week. This was one of the most helpful descriptions of the writing process I've seen! I think because I'm a sentence editor myself and staring a book right between the eyes is a daunting task. Thanks for sharing; it seems a little more do-able now! Very cool interview. What I would give to be able to dye my hair pink! Alas, I'm pretty sure that's never to be. I just read the His Dark Materials (Golden Compass) series this past week - amazing! If Laini Taylor liked it then maybe I would love her book too. Blackbringer is on my list of books to read! 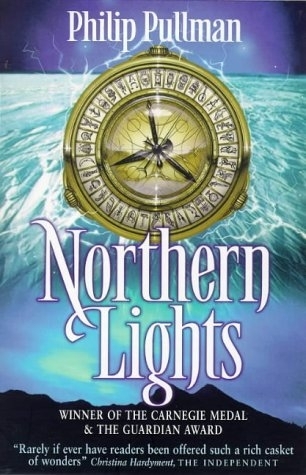 It's NORTHERN LIGHTS, not THE GOLDEN COMPASS, ********! Other than that, very interesting. Except the hair. Remember, Sassy=/=Good! According to me, anyway. Has too many disrespectful connotations. I'll have to read this book too! Now I have about four books that I NEED to read (the best problem to have, except that I'm broke at the moment, and my library does NOT have the kind of books that I want to read). I'm reading the Golden Compass now (sorry Dante, but the title says "golden compass"), so if I like it I'll probably like Blackbringer. Thanks for the author interviews Shannon, it gives me lots of book ideas! And I think sassy and pink hair are both good things! I'm really liking her hair. I haven't read either Blackbringer or Golden Compass (but have just reserved them at the library). I've looked for her book before but couldn't find it. :( I did request for my library to buy some copies though, so hopefully they will. I love her hair. Very sassy and spunky. Wish I had the guts to do that. Only I'd go for auburn crimson, because it would go well with my eyes. p.s. Haven't gotten my hands on B1000 yet, and I'm really anxious to read it. Hope everyone is enjoying it! Once again, thank you. This is fantastic. Woah. For a sec, I thought that Shannon Hale was wearing a pink wig and I'm like, what the heck? But, wow... pink hair. That's pretty fancy. I don't think I could pull it off, but it looks kinda cool. Click there and be enlightened,Q. NORHTERN LIGHTS is the title. Americans seem to require odd marketing and titles. Another example is HARRY POTTER AND THE PHILOSOPHER'S STONE, which is changed to SORCERER'S STONE, even though it is called the Philosopher's Stone in the legend. Blackbringer is one of my all-time favorite books. Personally I think its as good as His Dark Materials and can't wait to read the next ones! What country do you live in, Dante? With my Beatrice. Of course. Haven't you read the poem? Dante--are you saying you're in heaven, then? And I always wanted to slam a book at your head. Putting all those nice guys in Hell. Tsk, tsk. They're not nice. They're rotten bastards. They are in realms of eternal torment because of their actions. Besides, it's great fun to put contemporary leaders in their rightful place. All in the name of satire. Because it is parody, that means they can't take me to court, either. Besides, we're all dead now. Oh, well. I still love you guys anyways. PS Some serious love for the hair. Yes the hair is awesome. Distinctly sassy. In America philosopher doesn't mean the same thing as it does in England. Or so says my mom. Dante - it is the American publisher that changed the title of Northern Light to Golden Compass not the people like me that read the book. I don't care about the title - I just loved the book. For anyone considering reading Northern Lights/Golden Compass be sure to have the other two books ready to read - Subtle Knife and Amber Spyglass. NL/GC leaves you hanging at the end. If I didn't have the other two books too, I would have had to make a mad dash for the bookstore or library. AMBER SPYGLASS ends screwy. Doesn't satisfy. Yes, it was the publisher. Because they thought Americans wouldn't understand and therefore not purchase it than if it had a more magical connotation in the American mind. Touche, Dante. I didn't like the ending either. Dante I will ask that you please don't swear. The only thing I have to say about His Dark Materials (or whatever you call them) is that I cry everytime I see the trailer and I read them in reverse order. The only time I have ever done so. "Screwy" is cursing? I'd say it is more of a euphemism. Now think about what I could've said. I think she's referring to your use of the word "bastards". Really though, I would appreciate clean language too. I agree. I would much rather read my favorite author's blog without having to worry about reading inappropiate language. Just finished Blackbringer from Shannon’s recommendation. I fell in love with the characters especially the hero Magpie. She is a brilliant combination of Laura Croft (Tomb Raider) and a female Harry Potter; tough and unflinching in the face of danger and wants to help those who need help with no thought of herself and no knowledge of her great powers. I am going to make dragon fly wings and a black bird skirt and go as Magpie for Halloween. Yeah for Dreamdark!!! I just got this and I'll be reading it soon! Boy, did I love this book! Wonderful characters, wonderful magic--plus the illustrations! So beautiful! I get to meet Laini in just a few days. Now I know to look for the pink hair! I have finally read this great book! Thank you for the recommendation. When I met you at your book signing in Naperville, IL you mentioned it was excellent. I absolutely agree! I just read the His Dark Materials (Golden Compass) series this past week - amazing!